The need for upgrading electrical wiring in homes is becoming more prevalent these days as homeowners use more and more devices and appliances that require additional electricity. Long gone are the days when kitchen appliances, one television set, and a few lamps were the primary electrical draws. Now, there are multiple device chargers, multiple televisions, computers, video game consoles, and more to plug into outlets throughout the home. Upgrading electrical wiring will ensure you can continue accessing the electricity you need safely and efficiently. If you live in an older home, the need for new electrical wiring may be even more urgent, because wiring from 30 years ago can typically not support modern day electrical needs. Faulty or problematic wiring is a leading cause of residential fires, so this is definitely not something to put off if you think there may be an issue. Whether you are dealing with an emergency situation or just think it’s time to upgrade the electrical wiring in your home, you may be wondering what you can expect when you schedule an appointment. 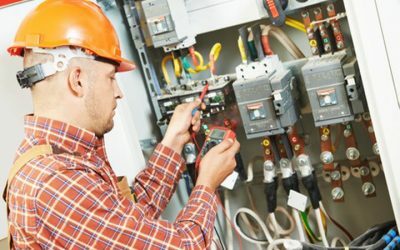 First, an expert electrician will come to your home to ensure your wiring system is capable of handling all of your current electrical needs. If he discovers it is not, he will notify you of your need for an upgrade in the electrical panel and/or wiring. You may also need to upgrade electrical receptacles and fixtures. The electrician will factor in the home’s age as well as the type of exterior on the home as he makes a plan for the new wiring installation. The utility company will disconnect the electricity to the home, which means the electrician will use a generator for electricity or will use tools that are battery operated. But the home will likely need to be without power throughout the installation process. The upgraded wiring will be installed as well as the new panel and any additional circuits required. Once the upgrade is completed, the electrician will notify the electric company to come out to reinstate electricity. Upgrading electrical wiring is no small or simple task, and it can be a little unnerving to go through the experience of having the power shut off to your home. The good news is you can have confidence and complete peace of mind when you choose Bryan Electric to handle the job for you. We have a strong commitment to not only exceptional workmanship but also to attentive customer service. We will keep you in the loop and are always happy to answer your questions before, during, or after we provide services. If you want to learn more about upgrading electrical wiring in your home or are ready to schedule an appointment for our professional electrical services, contact us today.